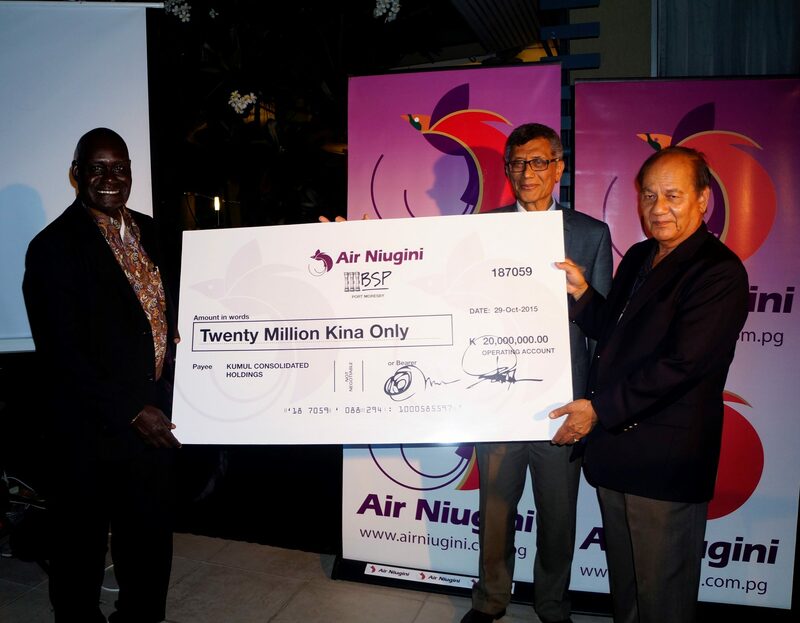 Air Niugini Limited has presented a dividend payment of K20 million to the State through Kumul Consolidated Holdings (formerly IPBC) which is responsible for the National Government’s shareholdings in state owned enterprises, including Air Niugini, and in doing so urged the National Government to expand its airports infrastructure and facilities improvement program. In making the presentation last night (Thursday 10th Dec 2015) during a Christmas function organised for ANG’s corporate clients, the Chairman of ANG Board, Sir Frederick Reiher, thanked the Prime Minister and his Government for its strong support for the airline, and in particular the support it has given in tough times when difficult decisions have had to be made. Sir Frederick said the strong support of the Prime Minister, the Minister for Public Enterprises and State Investments, Cabinet Ministers and Kumul Consolidated Holdings, had helped Air Niugini deliver a sound profit and a good dividend to its shareholder, the National Government. “The renegotiation of the employee contracts of the airline’s pilots, and others to follow, had helped ensure the airline will remain financially sound in a challenging airline industry and general national economic environment. Wider cost cutting and restructuring measures now under way will help ensure the airline remains not just viable, but is also able to improve its fleet and expand services to meet passenger demands,” he said. Sir Frederick said the impact of the end of the first LNG project construction phase from which the airline had benefited significantly as the lead air services contractor had been a real challenge. “However, even with the re-fleeting program, the board and management believe the economic environment in which the airline has to operate will continue to be difficult, putting pressure on revenue and profits,” he said. Sir Frederick acknowledged a number of significant infrastructure projects delivered in the last year by the National Government that were now benefiting not just the airlines passengers, but also enabling services to be improved. “The redevelopment of Port Moresby Airport is enabling passenger movements to much easier, and the modern airport terminal is now assisting with the airline’s commitment to making Port Moresby a regional hub for airlines in the South Pacific. The re-development of Mt. Hagen and Alotau airports which are now completed, and the work under way at the Goroka airport as well the upcoming re-development of Nadzab (Lae) airport will benefit Air Niugini and the whole airline industry,” he said. “The Board and Management of Air Niugini are determined to make the airline as efficient as possible – as that is the best way to maintain and expand its air services in the country and keep air fares and freight costs as low as possible,” Sir Frederick concluded.